Bobbi Brown is an icon in the beauty industry. She founded her eponymous company, Bobbi Brown Cosmetics, in 1991. And she built it by teaching women how to bring out their natural beauty through a “less is more” aesthetic and giving them the makeup tools to do it. Bobbi Brown Cosmetics was acquired by Estée Lauder in 1995 and has been a fixture at luxury beauty counters ever since. When I heard that Bobbi Brown was going into Walmart with a new product line, I was more than surprised. Walmart is, well, Walmart, where “Every Day Low Prices” is the appeal that each week attracts more than 275 million people globally to its stores and websites in search of bargains, most especially to its 4,756 U.S. stores. Bobbi Brown could sell anywhere, so why Walmart? This new product line won’t be makeup, but it will be featured in the Walmart beauty department. Called Evolution_18 by Bobbi Brown, it is a collection of ten ingestible beauty formulas that continues Brown’s commitment to natural beauty, this time based upon the idea that natural beauty starts on the inside. “I don’t care how much makeup you put on, if you don’t have your health and vitality, you’re not going to look pretty,” Brown shared with me. The creation of the Evolution_18 product line is another step in her lifelong beauty journey. 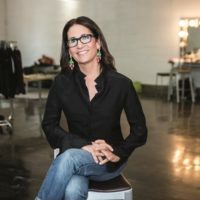 “When I started the Bobbi Brown Cosmetic brand 28 years ago, I always believed and taught my customers and people who worked with me about health,” she explains. “One of my missions is to help educate people that what they put in their body makes a difference. Now I have an opportunity to reach a whole new customer,” Brown continues. Brown officially left the cosmetics brand two and half years ago and went back to school at the Institute for Integrative Nutrition to become a certified health coach. She published her ninth book based upon her wellness learning entitled Beauty from the Inside Out. Evolution_18 became the natural extension of that. Now in partnership with Walmart, Bobbi Brown will expand that mission to fit everyone’s budget as well. “I have this amazing opportunity with Walmart to create a very special beauty-inspired line that will help redefine what beauty is and make it affordable for all.” All the products she notes will be priced under $20. In the planning Bobbi Brown worked closely with Walmart’s beauty and OTC teams to assure quality and efficacy of the formulas, which have been simplified from their original formulations to make them easy to understand. There are ten products in the line each for different parts of the body, such as hair, nails, collagen, tummy, hydration and energy and with different delivery systems, like effervescent tablets, gummy chewables and pixie sticks to dissolve probiotics on the tongue. With simple product labels in Brown’s favorite turquoise color that reminds her of the color of the Caribbean ocean and featured on end caps in 1,500 stores initially, the displays will be aimed to educate the Walmart customer that beauty starts on inside. That is why Evolution_18 was chosen for the beauty department, not the vitamin aisle. “What I think is revolutionary is this is 100% Walmart’s idea. Instead of putting these products on the vitamin shelf, they are putting them on end caps where you are buying your mascara and your skin care,” Brown says. Brown feels the energy and commitment of Pinson, Deschanie and the Walmart team and is thrilled by the opportunity to work with them to reach a wider audience. “I have been in the industry for such a long time and worked with every retailer top to bottom. I have never seen more enthusiasm and more willingness to do things the right way. I am really excited breaking in this way to Walmart, the world’s most powerful retailer,” she says. Brown admires the innovations that Walmart is doing with indie brands like Harry’s and how it is elevating its online presence. “Walmart is doing so well. It is growing and it pretty exciting to see,” she says. As for Brown personally, she understands the busy moms that Walmart serves. “I am just like everyone else that is overloaded, overworked, overscheduled and overvisualized with Instagram and everything else. When I go into a store, I want to know exactly what I am getting and why I am getting it,” she says.